The Chelsea supporter caught on camera verbally abusing Raheem Sterling has apologised for his behavior but denied that he used a racist slur against the Manchester City winger. Pictures of Colin Wing screaming an insult at Sterling during Chelsea's 2-0 win against City at Stamford Bridge went viral, with allegations circling that he had called the 24-year-old a "f***ing black c***". On Tuesday, Wing said he was "ashamed" of his behaviour, but claimed he had actually called Sterling a "Manc c***". "I’m deeply ashamed by my own behaviour and I feel really bad, but I didn’t call him a black c***, I called him a Manc c***," he told the Daily Mail. "I’ve been going to Chelsea for 50 years now and, because of where I sit, I’m picked up on the camera most weeks. If I had a history of saying this sort of thing I would’ve been caught by now. "Nobody around me said they heard anything. I want to apologise unreservedly to Raheem and hope he can be a better man than I am by accepting it. "I offer him an unreserved apology. Even if it wasn’t racist, it’s not right what I said. Even the swearing is bad – but I got carried away. "I was completely out of order, but I’ve lost my job and my season ticket now so everybody’s got what they wanted. So why can’t they leave me alone?" Yesterday, Chelsea suspended four fans from Stamford Bridge - including Wing - and said they are continuing investigations into the incident. 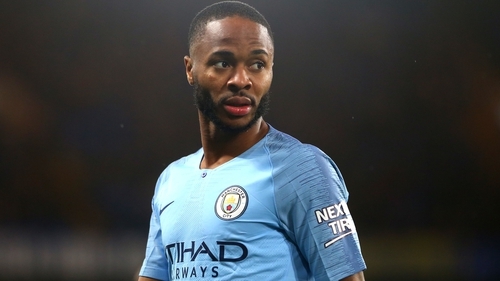 In an Instgram post on Sunday, Sterling wrote: "I just want to say, I am not normally the person to talk a lot but when I think I need my point heard I will speak up. "Regarding what was said at the Chelsea game, as you can see by my reaction I just had to laugh because I don’t expect no better."